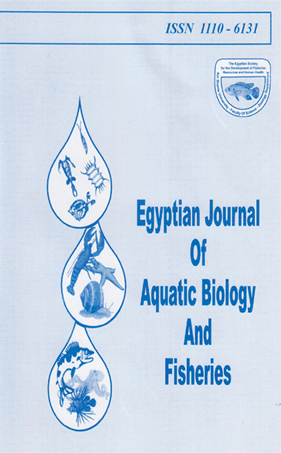 The present study was carried out for 120 days at Fish Research Station, belonging to the National institute of Oceanography and Fisheries at El-Kanater El Khairia The aim of work was to detect the effect of lipid sources (Poultry oil, Com oil and Linseed oil) and lipid levels (3 and 6 %) on immune response of Nile tilapia broodfish during the winter seasoa Total serum protein (TSP), total serum albumin (TSA) and Total serum globulin (TSG) parameters were used as immunoglobulin indicators. The (TSP), (TSA) and (TSG) were not significantly (P > 0.05) affected by lipid source or iipid level at water temperature over 16.85 °C. But significant differences were found at water temperature below 11,66 °C. These data showed poultry oil with 3% lipid seemed to be adequate for optimal functioning of immunoglobulin. The humoral response as measured by hydrogen peroxidase titer and hemolysin titer were not significantly (P > 0.05) affected by both lipid source or lipid level at water temperature over 16.85 °C while significant differences (P < 0.05) were found at water temperature below 11.66 °C. The data revealed that both com oil and linseed oil with 6 % lipid seemed to be adequate for optimal functioning of humoral immune response.